Whats Your Sign Video Slot Guide & Review - Casino Answers! What’s Your Sign is a 5-reel, 12-line video slot found at Vegas Technology casinos, featuring a wild symbol and a bonus game. You can play the What’s Your Sign video slot at Bovada. Bets on the What’s Your Sign slot machine are $0.01, $0.02, $0.03, $0.04, $0.05, $0.10, $0.15, $0.20, $0.25, $0.50, $0.75, $1, $2, $3, $4, $5, $6, $7, $8, $9 and $10. You can select from 1-12 paylines on the What’s Your Sign online slot. The minimum bet you can make on What’s Your Sign is a penny up to the maximum bet of $120 per spin. You can skill stop a spin manually by using the “Stop Spin” button during any spin you make. You can select your bet in What’s Your Sign by using the “Bet One” button and then “Spin” to spin the reels or “Bet Max” to play all 12 paylines. The Sun is the highest paying symbol on the What’s Your Sign video slot. If you land 5 Sun symbols on an active payline, you will win the 10,000 coin top jackpot. The Sun symbol is wild in What’s Your Sign and will substitute for all symbols except for the bonus symbol. You can win this jackpot by playing What’s Your Sign at Bovada. Whenever 3 Bonus Wheel symbols on any payline in the What’s Your Sign slot machine, you will trigger the What’s Your Sign bonus game. 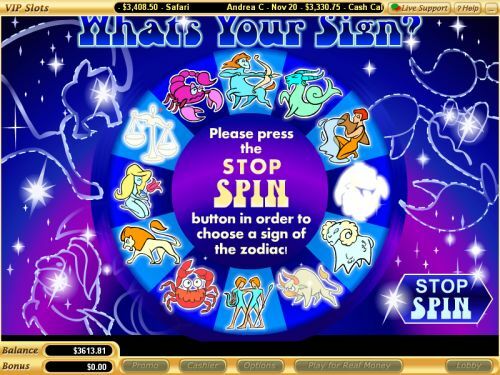 The bonus game is a bonus wheel with all of the various zodiac symbols. You will get to press the “Stop Spin” button to land on a symbol. You will be offered a prize depending on that symbol. You can either decide to collect the prize or spin again. You can play up to three spins. Payouts are displayed in the Paytable. Payline wins are multiplied by the bet per line. All wins pay left to right only in consecutive order. Only the highest win is paid per selected payline. Hit “Autoplay” to open up the What’s Your Sign autoplay mode where you can select the number of spins (5, 10, 25, 50, 100, 250 or 500) and number of seconds between spins (0.25, 0.50, 1, 1.5 and 2). Stop settings are stop once all spins are complete, stop when jackpot is won, stop if a win exceeds or equals ($50, $100, $150, $200 or $250), stop on any win and stop if credits increase/decrease by ($50, $100, $150, $200 or $250). You can cancel autoplay on the What’s Your Sign slot game at any time. For those who are into reading their daily horoscopes, you may enjoy playing the What’s Your Sign video slot. It’s a decent video slot with a great top payout and a simple, yet satisfying bonus game. However, there are special features that are absent from What’s Your Sign, such as scatter wins and free spins. To play the What’s Your Sign slot game, sign up and make a deposit at Bovada! Can players from the United States play the What’s Your Sign online slot for real money? Yes, players from the USA are welcome to play What’s Your Sign at Bovada. For an extended list of online casinos that host this slot game, please read our list of Vegas Tech casinos. How do I trigger the bonus game on What’s Your Sign? 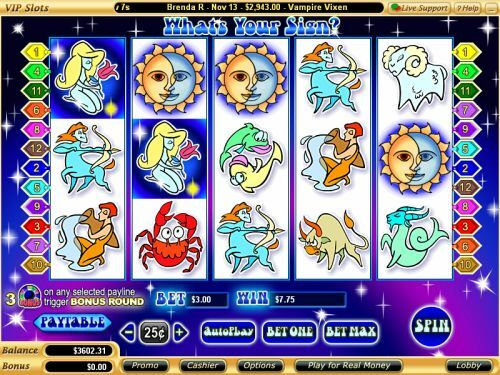 To trigger the What’s Your Sign Zodiac bonus game, you must land 3 Bonus Wheel symbols on a payline. The bonus symbol is not a scatter symbol. Can I play a flash game of the What’s Your Sign free slot? Yes, you can play an Instant Play version of the What’s Your Sign slot game in your browser with no download required at Bovada. You may play for free in practice mode or you can also play for real money. If you come across any issues with the flash casino, make sure you have the newest version of Adobe Flash Player.